u m a m i: Rome III- let's tuck in! Rome III- let's tuck in! We didn't eat as much pizza as I would have liked; it wasn't because the pizzas were no good, in fact what we had were absolutely yummy, but the stomach couldn't accommodate more. The first pizza I tried was at one of the many casual joints that sells them by the slice, there the quality ranged from stunning (green tomatoes and fresh mozarella) to bleah. 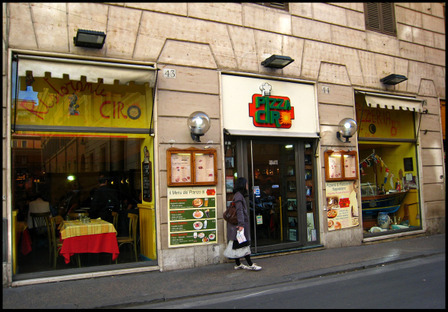 C took me to Pizza Ciro (Via della Mercede, 43/45, T: +39 066786015), she had eaten there before and liked it. 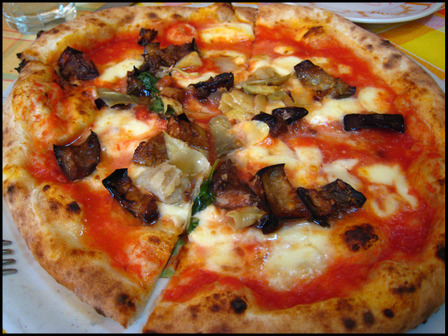 From the outside it looked quite ordinary and even a bit like a fast-food place but inside the space is huge and the pizza we shared was very good- see picture above- soft, chewy bread with slightly crisp edges, fresh mozarella, sweet grilled aubergines. 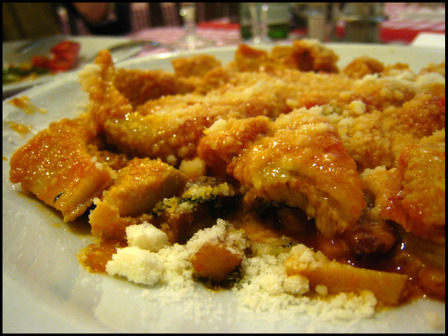 A stone's throw from our B&B is an old-school trattoria which C had managed to eat in every time she visits Rome. 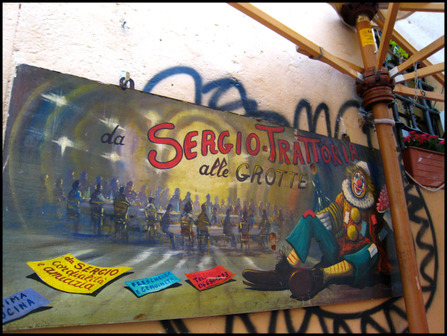 Da Sergio is quirky and rustic and though smack in the middle of Campo del Fiori it is popular with the locals. On my last day I was determined to try tripe, because braised tripe and other dishes made from offal and animal parts make up an important part of the Roman-Jewish cuisine. At Da Sergio I ordered their tripe in tomato sauce. It is typically served as a second course after the antipasto and pasta, but I requested it as an appetiser. It arrived looking innocuous enough, almost like pasta, but upon closer inspection the intestines had been cut into bite-sized wobbly chunks. The texture was chewy but not rubbery, soft and toothsome at the same time, but the tomato sauce, bacon bits and parmesan failed to mask its inherent strong flavours which takes a bit of getting used to. I managed about 5 pieces before giving up. If there is one dish we ate a lot of in Rome, it was pasta. Yes we were aware that they are other dishes in the menu, but well, pasta has its irresistable lure. On our first day we walked into Ditirambo, also within walking distance of Campo del Fiori, and all I could smell was black truffles. Unfortunately my dish of pasta with bolleto mushrooms sprinkled with the grated truffles, in spite of its beautiful perfume, was rather stodgy and bland. C fared better with fresh pasta sheets cooked in a sauce of salted cod, it too looked a mess, but was adequate enough. The rest of our pasta meals were much better, such as linguine tossed with a sauce of baby squids in La Campana, a hearty agnolotti at Piperno and a wickedly rich spaghetti carbonara at da Sergio- all shiny with an eggy, olive-oily, bacony sauce and crowned with a mountain of shaved parmesan. The best pasta, for me, was the papardelle with a ragout of wild boar meat and duck sausage at Al Bric, tender broad noodles with springy bite tossed with the long simmered meat sauce. If food has the power to move one to tears, this dish would stand a pretty good chance, I was in raptures, absolutely adoring it willing myself to eat each mouthful slowly to draw out the pleasures. And what better pairing for such a magnificient dish than an equally magnificient wine. The wine list at Al Bric, when it appeared, impressed with its weight and heft. It is almost 3 inches in height and is bound in thick worn red leather, the pages yellowed and feathery. C has a friend who gave her the name of 2 wines she absolutely must have while she was in Rome. We looked in the section for half bottles and the names were not in the page. But I saw a Barolo, surprisingly it was one of the less expensive options at about 32 euros, the price is for half a bottle so it was not exactly a bargain. The sommelier whisked away the wine glasses on the table and came back with more grown-up looking glasses (deeper rounder bowl, smaller rim). It was only my second time drinking Barolo but it is so easy to love, so full bodied for a single-varietal wine, so smooth and so sophisticated even for such a young wine. Before we knew it, we had drunk up the last drops. Feeling slightly bereft, and enjoying our happiness with the wine and food, we asked for the wine tome again. This time we ordered another half-bottle of Tignanello 2003 which cost slightly more than the Barolo but was not quite as seductive, I think it is hard to measure up anyway so we just sat back and enjoyed the wine and our conversation. The next day, at Piperno, C saw one of the names and ordered us a half-bottle of Amarone 2004. 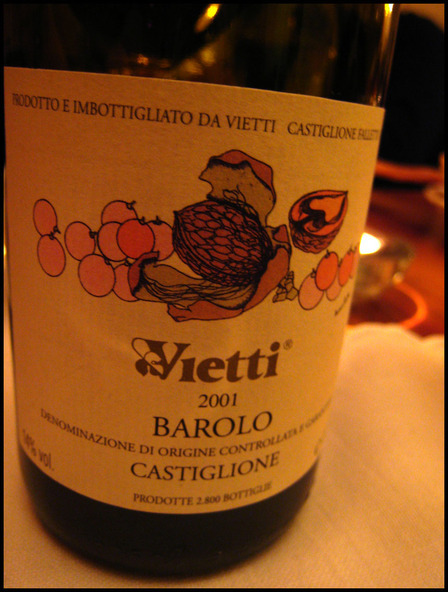 Drier and more tannic, it more than matched the fried yummies and hearty pastas with its rich raisiny perfumes. Onto the final course. Desserts. We didn't manage to eat a lot of it. 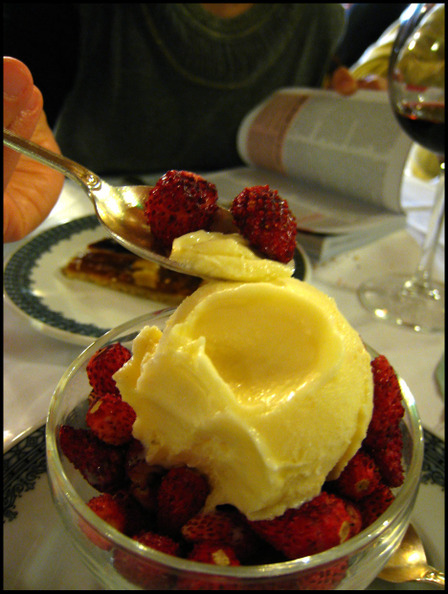 The pastas do occupy a lot of space in the tummy, but at Piperno they lay out all the desserts at the entrance so one can mentally prepare and make appropriate room for the tiny sweet strawberries with ice cream. Or fruit tarts served on its own. 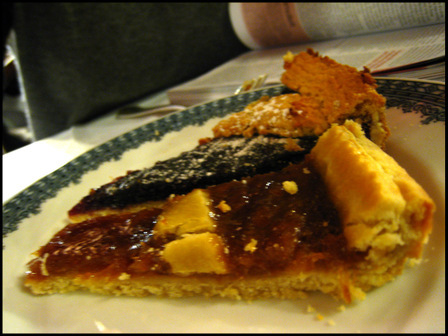 Bitter sweet orange marmaladey tart with tender pastry and the other a cherry filling with a nuttier crumbly crust. The orange tart won by a small margin but only just. To me, these tarts embody the spirit of the food we enjoyed throughout our holiday- traditional, unpretentious food with bold yet comforting flavours using simple, quality, local ingredients. It's food that is good enough that they don't need, or have, many 'ethnic' restaurants. It is also seemingly so facile that there are Italian restaurants all over the world, just that after this, for better or for worse, I know better.